Hi, my name is Chad and allow me to tell you a little about myself and a few of my hobbies. I've been a "ham" (amateur radio operator) since 1987, when I earned a Technician Class License. My first callsign was N9GVT, but only had it a short while, as I quickly passed my General and Advanced Class licenses and became KE9HJ. Less than a year after that, I passed my Extra Class exam and became WE9V. Even though we can change our calls with the FCC's vanity callsign program, I've decided to keep WE9V for the long term. I've had this call since 1988. My main activity in ham radio is HF contesting. Since I've become a ham, I've made over 209,000 contacts with that callsign, mostly in contests. I also guest operate at other stations and participate in multi-operator efforts. I've been a part of 332,869 QSOs (as of Dec 2017) at other stations including DX contest stations KH7R, KH7X, 6D2X, 6Y1V, FS5PL, PJ2T, P40L and A44A/A47RS as well as stateside contest stations K4JA (ex-KS9K,W9JA), W9UP, W0AIH, K9NS, and K9CT. So that's over 541,000 QSOs that I've been a part of. Check out my DXCC/QSO totals and also have a look at a listing of my contesting efforts. I bought my first house in 1998, and immediately began building a "modest" station. Outside, I have two towers. The main tower is 100' of Rohn 45. Antennas on the main tower include a two stack of KLM KT-34XAs (32' booms) at 50' and 100', and a 2 element yagi for 40M (XM-240) at 108'. The back tower is 56' of Rohn 25. It supports a third tribander (Mosley TA-34, 21' boom) at 56' and a Cushcraft A3WS 12/17M beam at 61'. Check out more antenna information and pictures. Inside, the station is designed to be a SO2R (Single-op, two-radio) station, but can be easily changed to support a small 2-radio multi-op. 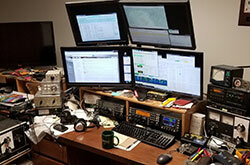 The hardware includes two Elecraft K3 (purchased new in July 2008 and Dec 2013), two Ameritron AL-1500 amplifiers, plus an Elecraft KPA-500 for day-to-day DXing. Click here to get a more complete station description.